Ai Weiwei’s surgery in Munich apparently went smoothly – two holes drilled in his head on Tuesday (or Monday evening?) to remove 30 ml of fluid from his skull. He says the pressure in his head has gone and so has the pain. He’d been suffering from headaches since police burst into his hotel room in Chengdu at 3 a.m. on August 12 and punched him. They also kept him confined to the hotel that day to prevent him from going to the trial of Tan Zuoren. See Danwei for more info. A large-scale public art project by the Chinese artist Ai Weiwei, to occupy the Pulitzer fountain outside the Plaza Hotel starting early next month, will go forward even if Mr. Ai, who was arrested by the Chinese authorities on Sunday, is unable to be present. 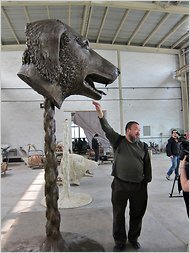 Ai Weiwei with one of his Zodiac sculptures at a bronze foundry in Chengdu, China. “Circle of Animals/Zodiac Heads,” Mr. Ai’s exhibition, is scheduled to open May 2 in the Pulitzer fountain outside the Plaza Hotel in Manhattan. As for the artist himself, Mr. Warsh said, “I’m very concerned about him and his safety.” Mr. Ai, who is sometimes called China’s Andy Warhol — an edition of his recent work “Sunflower Seeds” sold in February at Sotheby’s in London for more than a half-million dollars — is due to come to New York in the first week of May to unveil the new project with Mayor Michael R. Bloomberg, and to receive an award from the Skowhegan School of Painting & Sculpture. Mr. Ai’s 12-piece sculpture, “Circle of Animals/Zodiac Heads,’’ is scheduled to open May 2 and to be on display through July 15 at 59th Street and Fifth Avenue. It is the first major outdoor exhibition to be presented on the site of the fountain, according to the organizers, as well as the first by a contemporary Chinese artist in the city. The installation was inspired by the fabled fountain-clock of the Yuanming Yuan, an 18th-century imperial retreat just outside Beijing. Designed by two European Jesuit missionaries at the behest of the Manchu Emperor Qianlong, the clock featured each animal of the Chinese zodiac, spouting water at two-hour intervals. In 1860, French and British troops ransacked the Yuanming Yuan, pillaging the heads. Seven of them — the rat, ox, tiger, rabbit, horse, monkey and boar — have since been located. Ai WeiWei, Bubble, 2008, porcelain. 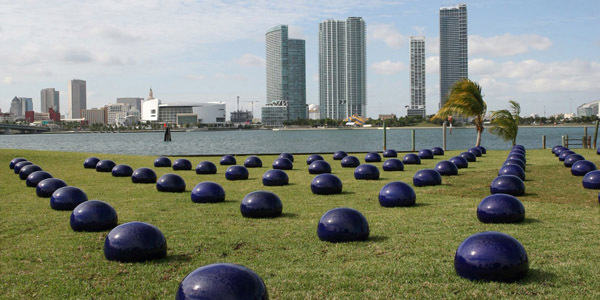 Installation view, Watson Island, Miami, 2008. This entry was posted on Tuesday, April 5th, 2011 at 12:22 am. It is filed under Action, Blog, China, Dictatorship, News, Politics, Posts, Preservation of Rights, The Arts, Unforgivable. You can follow any responses to this entry through the RSS 2.0 feed.